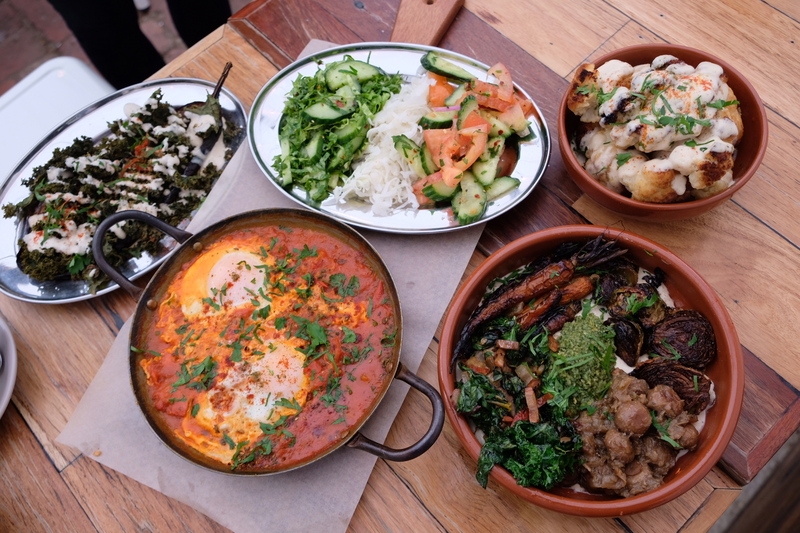 My Israeli friend recommended me to try Tahina Bar in Northcote not long ago. I realised later that they had opened a second outlet in the heart of Brunswick Street. Easy to get to by tram or car, we visited on a Sunday just after 2pm. Although the lunch hour had passed, there were still a few customers dining in on a wet Sunday afternoon. We sat under the sheltered outdoor area at the back. We ordered the Fresh Honey Spice Chai (made in Bonsoy), and it came in a small teapot. I love it when I can pour my second cup of Chai! My critique is usually “needs more spice”, but this one had just the right amount of spice and enough honey to make it creamy with the soy. It was a very enjoyable hot drink on a winter’s day. Cauliflower Papiot, $8.50, was another one I wanted to try, just because I’ve been tasting these lately and would like to compare. Although it wasn’t a whole cauliflower, it was still very soft when cutting through it. When I first bit into it, I could taste the sweetness of the cauliflower. This was a highlight for me; I think the lemon brought out the natural sweetness of the cauliflower. Tip: eat it while it’s still hot! Lastly, we had Tahina’s Seasonal Bowl, $15.50 roasted brussels sprouts, herb mushrooms, roasted heirloom baby carrots, sautéed kale and rainbow chard, hummus and zhoug. We were warned about the zhoug that if we can’t take spicy to stay away from it. Phew – I’m glad I did, I tried a bit and I definitely can’t imagine myself dipping any more. You can see there’s lots of veggies in the seasonal bowl, but each cooked differently. Brussel sprouts and baby carrots were both roasted, but you can’t taste one over-powering the other. Each kept to its distinct taste and C enjoyed the Brussel sprouts and sautéed kale. The sautéed kale had some chilli flakes in the sauce. The sauce had a lot of flavour compared with the other veggies in the bowl. I loved the baby carrots – sweet and just right in its softness. Yes – I’m a meat-eater, but sometimes it’s good to take a break and still have a good meal over a catch up with my friends. A couple of dishes filled us up very quickly, and you don’t always need meat to have a complete meal. For those who are Vegan or Vegetarian, it’s definitely worth a try. They have vegan ice cream, baklava and brownies – I will revisit with friends to try more of their other dishes! Location: 362 Brunswick Street, Fitzroy.